On 116.10.31 the Empires of Octavius will once again take a day to reflect and atone. Exorzismus, which is celebrated on the last day in October each year, is typically observed through fasting, atonement and silence. While there are no official celebrations or events, there are many ancient traditions. Octavius officials warn that pilots from other factions should not view this day of silence and atonement as a day of complacency, as none of the Exorzismus traditions preclude the pilots of Octavius from aggressively defending their space from outside attacks. (UUNN HQ) New TRI-SSM Director Yelda Mossad has released the following statement on the launch/dock systems failure that has shut down space traffic for the past 11 days. (Solrain Core) TRI Corporation today announced several organizational changes within its TRI Industries Division. “In order to better align with our new strategic initiatives, we have decided to make a few changes to the Leadership Team in TRI Industries,” said TRI Corp. CEO Garth Taren. “Effective immediately, Dorakk Thol is taking over the reins of the TRI Industries, reporting directly to me. Alwyn Pinguar has elected to take early retirement, and we wish him well with his new life. “Sagrith Hubri who has spent many years as one of Dorakk’s key advisors, will be stepping up as Director of the Manufacturing, Mercantile and Economics Group. Although not noted in the TRI announcement, it is clear that the shakeup is a direct result of the ongoing launch-systems debacle that has shut down all traffic to and from all stations. Economic impact from this has been estimated in the tens of millions — and counting, since there is still no word when systems will be restored. 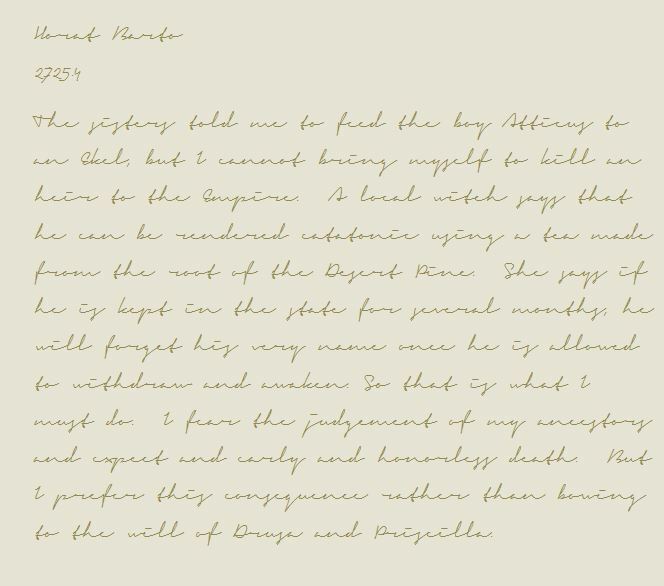 (Solrain Core) On 116.9.30, DSS decryption expert Hammer-BS published a decryption from a DSS1 found in The Split with an image of what appears to be a handwritten log or journal that seems related to the story of Atticus Lucanus, who later became Emperor Atticus Primus of Martius. The sisters told me to feed the boy Atticus to an Ekel, but I cannot bring myself to kill a(n) heir to the Empire. A local witch says that he can be rendered [catatonic] using a tea made from the root of the Desert Pine. She says if he is kept in the state for several months, he will forget his very name once he is allowed to withdraw and [awaken]. So that is what I must do. I fear the judgement of my ancestors and expect an early and honorless death. But I prefer this consequence rather than bowing to the will of Drusa and Priscilla. We asked Professor D. Karr of the University of Soria at Sol Core (USSC) to give his analysis of this find. “There’s actually quite a lot of information packed in here,” said Karr. “The story appears to provide previously-unknown details about the abduction of Atticus Lucanus in 2725.4 (old Imperial Calendar) which is 35.4 BT. I cannot find any data on Horat Bario. “From the document, we also learn that the plot was to kill, rather than abduct the young heir – and that Desert Pine root, a well-known hallucinogen, was used to drug him instead. We also have clear implication of Drusa and Priscilla, the aunts of Atticus Lucanus, in the plot to remove him from the accession line. But along with the apparent “answers” offered by Professor Karr, there are also other nagging questions. Why was this specific log page imaged and saved? And why was it found near Amananth, in The Split, rather than from somewhere near Martius? Perhaps the questions surrounding authenticity are the reason for the complete lack of reaction from Octavius. (Martius) A late-night explosion has leveled the Legatio building in the capital city of Martius. There have been no reports on casualties, but because of the timing of the blast, it is not expected than many were in the building at the time of the explosion. Etruscera Security is current on-site, but no official statements have been released.